La Petite Roche is a rock outcropping on the Arkansas River. Geographically speaking, it is at the intersection of the Ouachita Mountain foothills, the Gulf Coast Plain, and Arkansas River delta. It's also known as Point of Rocks. It was first noted by Jean-Baptiste Bénard de La Harpe, one of Arkansas' first European explorers on April 9, 1722. La Harpe Boulevard, that runs along Riverfront Park, is also named for him. The Point of Rock was the first rock outcropping on the Arkansas River as you ascended from Mississippi and it created a natural plateau above the floodplain. The Point of Rocks made a great landmark for early settles and a basin for boats. Geologists call it the Jackfork Formation. Jean-Baptiste Bénard de La Harpe didn't actually name Little Rock. Little Rock (Le Petit Rocher) was named by the French. La Harpe named the larger rock outcropping "le Rocher Francais." According to the Arkansas Encyclopedia, the earliest use of the name “Le Petit Rocher” was in 1799. Locals popularly call it "La Petite Roche." Much to history buff's disappointment, you can no longer see the rock outcropping in its original form. Unfortunately, progress took its toll on the original landmark. In May of 1872, a bridge was commissioned at the Point of Rocks. The bridge was intended to act as a railroad bridge, but the project was abandoned. The Point of Rocks, however, had already suffered some significant development. It no longer looked as impressive as it once did. This would not be the last time the area was developed. In 1883, the Junction Bridge was commissioned and the rock suffered even more excavation. The Junction Bridge was a Union Pacific railway bridge that carried trains across the Arkansas River until 1984 when its railroad use ended. Today, it's a pedestrian walkway. However, the Point of Rocks was further changed even after the bridge was constructed. In 1932, the Point of Rocks was further changed for tourists. It was decided that visiting the outcropping itself was too dangerous, so a 4,700-pound chunk was removed and moved to the grounds of city hall, and a time capsule was placed inside of it. This piece sat in City Hall until 2009. In 2009, this piece was returned to the Arkansas River and given its own plaza. The plaza highlights the history of the area and is next to a pathway that leads to the Junction Bridge Junction Bridge Pedestrian and Cycling Walkway where six panels give some information about the site history. This plaza is located near the north end of Rock Street near the History Pavilion in Riverfront Park. If you want to see the rock today, it still sits there with a historical pointer on where the old outcropping was. If you are walking in Riverfront Park, La Petit Roche Plaza is between the Riverfront Amphitheater and the Junction Bridge. There is a fence separating the plaza. It's hard to miss, but we recommend walking through the rest of the park too. The entire park is one of the can't miss attractions in downtown Little Rock. Riverfront Park is filled with fun historical facts about early settlers. The 11 block park also has walking trails and some glimpses of the Arkansas River. It's worth a trip if you're in town. It's connected to the Arkansas River Trail. Riverfront Park has lots of activities for families, including a splash pad and play areas. 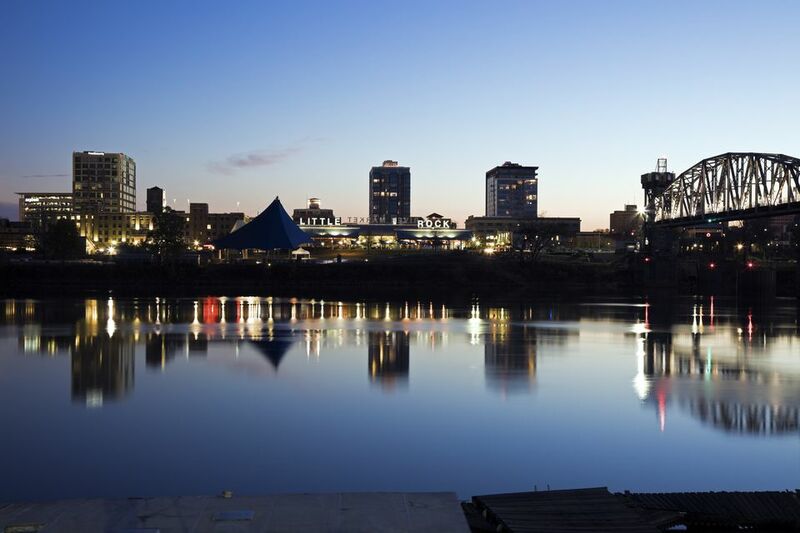 A walk along the river showcases Little Rock's history and Little Rock's present and future, as the River Market area hosts some of Little Rock's best bars, nightlife, and restaurants. It also has some of the best attractions in the area including the Old State House (great for learning more about Little Rock's history) and the Museum of Discovery and it's not too far from the Clinton Library and Heifer International.